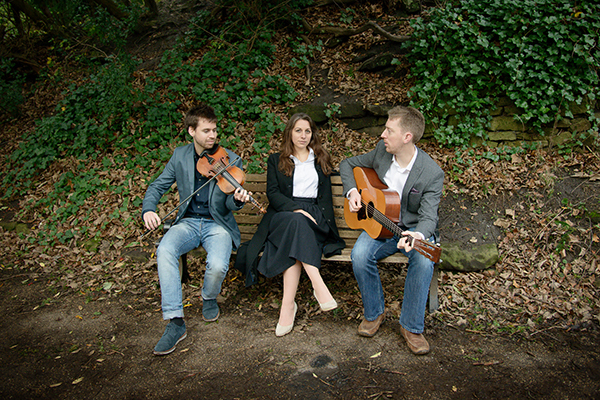 Night Fall is a new trio of voice, fiddle and guitar, based in Newcastle. Kevin Lees, a fine player of Scottish and Northumbrian traditions, was brought up in the vibrant folk scene in Newcastle under the guidance of Stewart Hardy and Kathryn Tickell, and as an early member of Folkestra out of which came the Young Folk Award-winning band Last Orders. Dave Wood is regarded as one of the leading guitarists on the folk scene due to his innovative, rhythmical accompaniment style. He played for several years with the acclaimed CrossCurrent before touring with Scots song band Malinky from 2007 until 2011, and with celebrated Northumbrian musician Tom McConville. Kate Locksley comprises one quarter of the critically acclaimed harmony group The Teacups the all-female trio, Wychwood, and is part of The Theatre Ballads, a visual media project with a puppet theatre that has recently been awarded funding from the EFDSS/PRS Talent Development Scheme. A chance meeting at a Midsummer festival encouraged them to collaborate, bringing together their different experiences in a delicate, assured sound.